What Exactly are Ear Infections? Ear infections can be both extremely painful and disruptive to everyday life and can be caused by bacteria or viral pathogens making a new home in a mucus filled cavity, usually filled with air. They occur more often in children than adults due in part to their weaker immune systems. Some common contributing factors that can often lead to ear infections include; upper respiratory infections, food & environmental allergies, genetics, nutritional deficiencies and wax build-up. There are three main types of ear infection, these are known as; otitis externa, otitis media and otitis interna. Of the three types, middle ear infection or 'otitis media' is by far the most common. The skin of the ear canal can also become irritated and inflamed and thus become infected by bacteria or fungus. This can happen at any time and sometimes for no apparent reason. People who swim a lot and people prone to allergies are more likely to develop an infection but it can happen as a part of the common cold too. An infection can cause pain (due to pressure build up) and some temporary hearing loss. Sometimes ear infections pass on their own after about 3 days but if not, some treatment may be required. 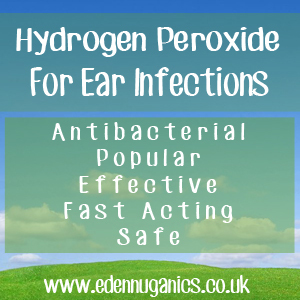 When it comes to our ears hydrogen peroxide is amazing stuff. This powerful natural liquid is able to not only dislodge hard to reach areas of ear wax, but also disinfect, kill viruses and bacteria and improve the general health of our ears. Blocked or clogged ears are known to be much more susceptible to infection, making regular cleaning with H2O2 a good preventative measure for those who frequently suffer from infections and allergies. First, tilt the affected ear up or lie on your side. Pull the ear backward and upward to open the ear canal. Squeeze 2-3 drops of 3% hydrogen peroxide solution into the ear canal. You will notice a bubbling/fizzing sound as the oxygen is released from the H2O2. Wait until the noise has stopped. This usually takes around 3 minutes but may take up to 10 minutes. Next, slowly tilt your head to the other side, letting the solution flow out onto a towel. After a minute or two, pour some pre-boiled warm water in the ear to help remove any leftover dirt or wax that may be still lodged in the ear canal. Lastly, a small amount of rubbing alcohol, also known as surgical spirit, can be squeezed into the ear. Be sure to drain this out after a short period of time. It will help to keep the ear canal clean and dry. Apple Cider Vinegar - Apple cider vinegar is a natural amber liquid with an array of potent antibacterial, antifungal and antiviral properties that can be put to use in the treatment of even the most severe ear infections. Two or three drops can be applied to the affected ear, in the same manner as above, twice daily until symptoms improve. Salt - Salt is another great traditional remedy that has long been used in the treatment of ear infections. Heat some pink Himalayan salt in a pan for around 10 minutes until the rocks have absorbed the heat, then add them to a clean sock or gauze that you can tie a knot in. Once the salt has cooled to a comfortable temperature place the salt over the ear but with the ear facing downwards. The heat generated from the hot salt will help draw out fluid from the ear and relieve swelling and pain. Garlic - The powerful antimicrobial effect and natural analgesic qualities of garlic, make it highly effective in the treatment of ear infections. Garlic oil can be made by cooking four garlic cloves in four tablespoons of sesame oil until the mixture begins to turn black. Next, simply strain the solution and allow to cool. Once cooled, apply two to four drops of oil into the infected ear in the same manner as regular eardrops.